Nigel Kane is the new manager of Hastings United, according to the football club’s website. 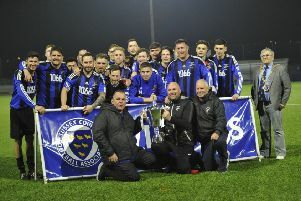 As reported by www.hastingsunitedfc.co.uk, the club has moved swiftly to plug the gap created by Dom Di Paola’s resignation after the 2-0 defeat at Hythe Town on New Year’s Day, with Kane having been installed as the new first team boss on a permanent basis. Kane will require no introduction to United supporters, having previously occupied the managerial hot seat at The Pilot Field, initially in a caretaker capacity towards the end of November 2005 after Neville Southall’s tenure was brought to a halt, then as joint player/manager with Pat Brown, before taking sole charge and going on to lead the U’s to promotion via the play-offs at the end of the 2006/07 campaign. He left the club by mutual consent in December 2007, but returned as part of Terry White’s coaching team in February 2014, and was subsequently appointed to a new role as head of footballing development upon Di Paola’s arrival from East Preston in October. As has been the case in his erstwhile position, Kane will be assisted in the dugout by Mark Stapley, while John Masters will remain part of the backroom set-up, and Ryan Light will be returning to the club as first team coach. Kane was interviewed for the vacant position after White’s resignation, but was ultimately forced to rule himself out of contention due to work-related commitments, which have since eased sufficiently for him and Stapley to take very hands-on approaches to their football development duties, with the club having found itself without under-21 or under-18 management teams in recent months. Their knowledge of those two playing squads could be a very useful asset in the coming weeks, with one or two players having opted to leave the club in the wake of Di Paola’s departure. Young striker Ben Phipps and midfielders Kyle Holden and Matt Cunnington were all on the bench for Saturday’s visit from Burgess Hill Town, while another name to perhaps keep an eye on is 17-year-old full-back Jordan Harris, who has been a regular in the Sussex County FA under-18 representative side this season, and was today selected in the squad to face their London FA counterparts on Sunday January 18.